I see a lot of modern-looking structures along the highway. There's probably a higher concentration of unique designs out on the road because of the desire to catch your attention as you whiz past. Some of the most interesting roadside attractions are also the most mundane. Consider the lowly highway rest stop. Many of our state's rest areas don't even offer travelers a rest room. But a few rest stops found along Oklahoma interstates feature picnic tables under stylized tepees. I've always admired this clean and simple form made of nothing more than three sticks and a circle. Another mid-century solution to shelter stylish picnickers was concrete. Lots of concrete. I spotted a good example of structural concrete shelters at a city park in Enid. These umbrella-like canopies, and their single support, are made completely of concrete. Public works projects are quite often accessorized with the latest look. This simple little shelter overlooks Broken Bow Lake and appears to serve as nothing more than a bulletin board holder. But a pleasant one none the less. State lodges are also a place of pride. 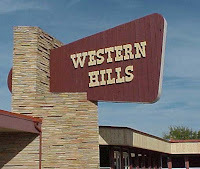 The Fifties and Sixties were the height of state lodges in Oklahoma, and Western Hills Lodge at Sequoyah State Park near Wagoner is one of the finer examples. The combination of sandstone and redwood is the epitome of mid-century style, and the tomahawk-shape sign echoes the western theme. I could go on for hours. These are just a few images. There are many more examples waiting to be discovered on your next roadside adventure. I have actually visited a couple of these. One is along I-40 between Sallisaw and the Muskogee Turnpike, and the other group is on I-35 north of Oklahoma City (maybe near Perry?). The shelter at Woodward park in Tulsa is a great example.